Posted on Tue, Feb 14, 2012 : 5:59 a.m.
Bankruptcy judges make emergency managers look downright palatable — yet we continue to pretend that our cities aren’t headed toward financial calamity. Missing from the fierce debate over the increased power of emergency managers to avert financial disasters at distressed Michigan cities is a genuine recognition of the upheaval posed by municipal bankruptcy. 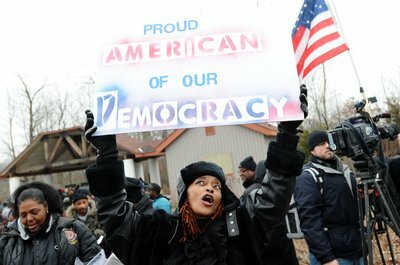 Protester MaryAlice Adams of Benton Harbor holds a sign and chants during a rally at Parker Mill County Park before marching to the gate of Gov. Rick Snyder's subdivision last month. The protesters rallied against the state's emergency manager law. When a city files for Chapter 9 bankruptcy — which is entirely possible for the city of Detroit and other essentially insolvent municipalities — “everything is thrown into uncertainty,” said John Pottow, a bankruptcy law professor at the University of Michigan. Indeed, bankruptcy should be frightening for cities — but many seem to be so focused on opposing the installation of an emergency manager that they’re losing perspective. A bankruptcy judge could be much worse. Republican Gov. Rick Snyder has championed Michigan’s strengthened emergency manager law as a way to prevent cities from slipping into financial disasters, including bankruptcy. Signed into law in March, the legislation, Public Act No. 4, gave emergency managers controversial powers such as the right to slash union contracts, replace elected officials and sell off assets in an effort to return governmental entities to financial sustainability. Democrats have slammed the law, saying it undermines the democratic process. Whether emergency managers should be allowed to strip elected officials of their powers is certainly a legitimate debate. That debate should continue. But let’s not make the mistake of forgetting that they might lose most of their powers anyway. To be sure, Chapter 9 bankruptcy does not allow judges to unilaterally axe collective bargaining agreements or approve a “cram-down” option of forcing creditors to reduce debt, Pottow said. Chapter 9 bankruptcy was designed to force parties to negotiate sustainable solutions to the cities' financial emergencies. But you can safely assume a federal bankruptcy judge won’t allow cities to sign new union contracts that maintain the status quo — or anything close to it. Within Chapter 9 bankruptcy, “burdensome labor contracts can be rejected for cause," unfunded pension liabilities could be eliminated and there's "no priority for wages, vacation, pension or healthcare,” according to a November 2010 presentation by New York law firm Chapman and Cutler LLP. City contractors don’t fare well under Chapter 9 bankruptcy, either. Grand Rapids-based law firm Varnum said that to reject union contracts under Chapter 9 bankruptcy court, municipalities have to prove the contracts are substantially detrimental to their financial viability and prove they've made a reasonable attempt to renegotiate deals, among a few other obligations. "These are not very onerous standards for a public entity to meet if it truly is in a financial crisis," Varnum says on its website. Bankruptcy judges are generally not swayed by emotional pleas and political rhetoric. After all, they’re appointed — not elected. They don’t answer to the ballot box, so it’s much easier for them to sign off on unpopular decisions. A bankruptcy judge, seeking simply to balance a city’s budget, will readily condone recommendations to sell off treasured community assets, Pottow said. Howard Ryan, director of legislative affairs for the Michigan Department of Treasury, said bankruptcy must be avoided at all costs. Ryan, who helped author the emergency manager legislation, said an emergency manager is a “kinder, gentler” way of helping governmental entities address their problems. Bankruptcy is a mess for cities and it would be a mess for the state, too. Economists fear that if the city of Detroit files for bankruptcy, Michigan’s credit ratings will fall, boosting interest rates on state debt — which would lead to higher taxes or reduced spending. And, of course, if the city of Detroit files for bankruptcy, it would be a public relations disaster. “Imported from Detroit” is a nice message we can all believe in — unless Detroit goes bankrupt. Nonetheless, there’s a temptation to wonder whether bankruptcy may not be so bad. It worked for General Motors and Chrysler, right? Wrong. That was Chapter 11 bankruptcy, which gives the court greater authority to help companies reduce debt and return to profitability. Also, GM and Chrysler entered bankruptcy with $50 billion in financing from the U.S. government. Chapter 9 bankruptcy is “not like the corporate world, where it’s happened often enough and there’s a whole litany of legal precedent, professional precedent,” Snyder told AnnArbor.com in January. “You’ve got a lot more uncertainty” in Chapter 9. Nonetheless, bankruptcy may be the ultimate destination for Michigan’s distressed cities — particularly Detroit, which is expected to run out of cash this spring, according to an external audit by Ernst & Young. Looming over the debate about Michigan’s emergency manager law is a petition drive organized by a Detroit-based nonprofit called Michigan Forward, which has said it’s close to delivering enough petitions to immediately suspend the law and place it on the ballot for voters to decide in November. Without an emergency manager to implement austerity measures or a consent decree between financially strapped cities and the state, we’re left to simply hope that cities, unions, bondholders and creditors decide to work together to shore up cities’ finances. We’ve been hoping for years — with little luck. Brandon Jessup, a 2005 Eastern Michigan University graduate who founded Michigan Forward, said cities can fix their own problems. “There’s nothing to be afraid of in democracy. We believe in democracy. We believe in the process, so we don’t foresee crises,” Jessup told AnnArbor.com in December. Actually, there is something to be afraid of in democracy: bankruptcy. Sat, Feb 18, 2012 : 7:12 p.m. Sat, Feb 18, 2012 : 7:02 p.m.
Thu, Feb 16, 2012 : 2:38 p.m. Wed, Feb 15, 2012 : 6:32 a.m.
Mr. Bomey, excellent article detailing the rigors and consequences of Chapter 9 bankruptcy. If Detroit collapses into bankruptcy, Michigan tax payers will quickly understand the differences in costs between the relatively benevolent and efficient EFM and the stark, brutal, costly reality of bankruptcy. The legal fees will quickly eat up any rainy day funds the State has put aside. A tax surcharge may even be required. Bondholders will get a rude awakening, as well. Anybody check to see who/what typically holds municipal bonds? Retirement funds and risk-averse retirees are typical holders. What about the merciless asset sales by unknowing or uncaring Federal judge(s)? The DIA for instance has one of the great art collections in the World; not only a Detroit treasure, but a Michigan treasure. The large city that I currently live in is pretty flush with cash ... and would be an eager bidder at a City of Detroit fire sale, I'd guess. Also, what about the higher interest expenses caused by a Michigan downgrade by S&amp;P and Moody's? I wonder if many of the signers of the Michigan Forward petition had thought about these consequences ... or even know what Democracy is? It's not an entitlement. So as many of the commenters here rale against the Michigan EFM law and lament/debate the trampling of Democracy (and how many angels can fit on the head of a pin, etc. ), more than a few former Michigan residents ... and others will be looking on as this tragic story continues to unfold. At the end of the day, Michiganders will get what's deserved. I'm certain. Wed, Feb 15, 2012 : 2:04 a.m. But of course, business101 teaches you that going bankrupt _as a business_ is a GREAT and PROFITABLE strategy. What is good for the goose is NOT good for the gander, I guess. In midwest-speak. Nathan - great piece of logic. Let's just get rid of government altogether and just put in EMs right from the get go. They know way more than anyone (even more than Business Editors) so why bother with this messy democracy thing. It's all about letting 'businessmen' like Mitt who know how to create 'wealth' (for themselves more often than not), right? We don't need elections, candidates, etc. Just strong minded leaders who know what is needed and can ram it through all the weak people, right? All we really need is a huge equity firm to run things and create the right kind of world for all of us, well for perhaps 1% of us. Wed, Feb 15, 2012 : 12:52 a.m.
yeah, yeah, this paper &amp; Nathan B., seems to be on a mission at the behest of the Michigan Republicans to support their unconstitutional agenda. This is not the first time, an article in praise of emergency managers have been promoted by Mr. B. Read the constitution, people have a right to be represented by the people they elect...no matter what. If they are unsatisfied, they can recall their elected officials. In addition, these so-call bankrupt cities with no money have to pay an outrageous salary to their new overlord who took over their cities/schools, fire their elected officials, toss out contracts, sell any property, close any schools,...all in the name of fiscal responsibility. Fiscal responsibility doesn't trump the rights granted by the constitution. It's remarkable how these moral &amp; constitutional repubs bend the constitutional whenever it fit their needs...and screech when someone actually tries to follow it. Check the small print, Mr. B... of the loosey goosey words that allow the constitutional rights of people to be suppressed by people who can make huge salaries, have a never-ending time limit and have questionable qualifications. Are you trying to get a job with the Gov. or the repubs? If I remember my history, slavery was once deemed better than freedom from their benevolent masters. This is not close to slavery, but the benevolent emergency managers imposed by the repubs on people who can vote for their representation should be stopped. Return to the old system and let cities/schools decide their own financial stability with the old law. Tue, Feb 14, 2012 : 11:38 p.m.
We are still a democracy, I think. The processes of Democracy are messy by the very fact that all can speak, all can vote ( or should be able to) and the variety of perspectives and opinions makes for a lot of noise. However, this process has mostly worked for many, many years. Now we are at a point where we have a Governor saying, Democracy is irritating and not worth the bother, therefore I am going to appoint &quot;Emergency Managers&quot; who have ???? qualifications to take over problemed schools, citys or whatever he choses who in turn have the power to boot out all elected and community chosen individuals. This is against the tenets of a Democracy. Instead of taking sides and positioning ourselves into mandates of having to have no emergency managers or all powerful emergency managers, having appointed emergency managers move into a system to work with the elected/appointed persons would seem to be the most feasible for possible win-win for all sides. Now these emergency managers would need to have credentials/experience in trouble shooting difficult situations. Businesses use this type of personnel all the time so hopefully our Governor has been wise in his selection process to seek out those persons with valid credentials in trouble shooting the types of situations in which they are placed. I have yet to read any information about the selection process of emergency managers, their credentials/qualifications for taking on any of the projects. I strongly support having our Governor's Emergency Manager law over turned and replaced with an act that would offer supportive skilled assistance to the existing elected and community appointed officials. I believe that most people do their best and when their best is not good enough, then assistance is appropriate. Gross incompetence and illegal activities need to be dealt with in the same manner as with any elected official. Wed, Feb 15, 2012 : 10:34 p.m. I'm puzzled by the response referring me to the State Constitution. I'm concerned about the booting out of elected officials by the Governor and the arbitrary assigning of emergency managers who have unknown qualifications to take over problemed entities. I reviewed the identified articles suggested and they aren't addressing this particular arena of activity. I don't read where the Governor has the power to remove elected officials without cause and due process. Tue, Feb 14, 2012 : 9:47 p.m.
Tue, Feb 14, 2012 : 8:39 p.m.
Nice comment Scylding. Let's face it; it is politics. Had &quot;Jenny&quot; implemented such a law, it would have been well received by the left, and challenged by the right. The penalty for poor performance is intervention. It's been that way forever, and rightfully so. Sat, Feb 18, 2012 : 6:20 p.m.
Get your facts straight. &quot;Jenny&quot; implemented the law in Benton Harbor. <a href="http://www.npr.org/2011/05/11/136203379/michigan-town-bristles-under-appointed-manager" rel='nofollow'>http://www.npr.org/2011/05/11/136203379/michigan-town-bristles-under-appointed-manager</a> The law has been around since 1990. It was put in place by Blanchard. <a href="http://bentonharborfacts.com/" rel='nofollow'>http://bentonharborfacts.com/</a> As governor, one of the first things Snyder did was to modify this law to grant the EFM more power. Under Public Act 72, the EFM could negotiate labor contracts but not invalidate them. The EFM could not fire the mayor, city counsel, and other democratically elected officials. The EFM could not dissolve cities and consolidate the citzenry into townships or nearby municipalities. All these were added by Snyder. These changes have been challenged by voters on both the left and right. Tue, Feb 14, 2012 : 8:29 p.m. I find it endlessly amazing that people appeal to &quot;democracy&quot; as some kind of cure-all that can solve all ills. Was it not under what these people call &quot;democracy&quot; that this city has run onto its own sword? These days, I don't trust people's definition of democracy. It stems from the Greek words for &quot;people&quot; and &quot;power,&quot; and means, loosely, power to the people. But the way lefties talk about it, it means &quot;entitlements to the people.&quot; With power comes responsibility, something in very short supply in Detroit, unlike entitlements, in which it has been awash for decades. It is the practice of this lax definition of &quot;democracy&quot; that has destroyed Detroit and is destroying many cities. It is no mystery that so many left-leaning cities in the country are failing. They fail because of what they believe and what that belief causes them to do. Anyway, as I have opined before, more than once, we do not live in a democracy. Athens was a democracy. We live in a constitutional republic, and in it, we are supposed to elect officials who will prosecute the will of the people, a will that is meant to adhere to responsible living, not trying to live on somebody else's dime. Detroit has been doing that for over forty years now, and I support whatever measure will bring that to an end the fastest. I strongly suspect that going back to Detroit's idea of &quot;democracy&quot; is not that way. Wed, Feb 15, 2012 : 2:57 a.m.
Tue, Feb 14, 2012 : 6:47 p.m. I don't care how you spin the issue of EMF laws verses bankruptcy. When you cancel out a person's vote for an elected official its an assault on democracy plain and simple. Taking away someones vote is taking away a part of someone's freedom. Tue, Feb 14, 2012 : 8:42 p.m.
Well spoken Cinnabar!!! Society is an integrated system. If you only look at one aspect, you will indeed miss another. Tue, Feb 14, 2012 : 7:47 p.m.
Where do you get &quot;cancel out a person's vote?&quot; Cities get their power from the state. In bankruptcy, the elected local officials don't determine anything either. Tue, Feb 14, 2012 : 7:25 p.m.
And taking money from me to pay for said failure is taking away my freedom! A good story that well explains why the EFM law is appropriate. Thanks Nathan. I have no doubts that those who oppose the law are not upset about the law itself but who put it in place. Had Virg Bernero won the election and done the exact same thing all those same people would be very supportive. It is mind boggling why anyone would oppose it and I think city councils are relieved because they often cannot make unions budge, or have the magical ability to make new revenue appear. Per the Detroit Free Press, Detroit City Council has been discussing making big cuts for months but just would not act. It seems as though there is a &quot;let's wait until the very last minute&quot; to make drastic decisions when the reality is that the sooner the better. Also solving debt crisis is only one half of the task. A city also has to try as much as possible to draw business and residents, otherwise people will avoid cities that look like ghost towns. Tue, Feb 14, 2012 : 5:28 p.m.
Good for you Nathan in your attempt at trying to explain this situation clearly. But don't expect much love from the unionoids and their symbiotic enablers the politicians. And don't expect rational arguments from the people whose rice bowl you're trying to take away either. They can't and won't get it. Ever. Tue, Feb 14, 2012 : 5:16 p.m. The crisis facing some Michigan cities is based on the fact that elected officials have failed in their responsibility to address their financial problems. Add to that rampant corruption, Detroit is a wonderful example, and you end with a choice between a bankruptcy judge and an EM. It is not relevant how citiies and school districts are funded. You have to budget and make choice and politicians seem incapable of doing this in a number of cities. It would be pointless to hand out money to these incompetent officials. There is no point in throwing good money after bad. Tue, Feb 14, 2012 : 4:53 p.m. In the case involving Detroit I don't think it matters either way. Detroit is going down the drain, it has no money, it has no one that can lead them out of this mess and it is paying enough city workers and relatives as if there where two million people paying taxes to the city. In reality there are very few paying taxes in Detroit, including the leaders. I do not think there is any hope for Detroit other than starting over new. Tue, Feb 14, 2012 : 7:42 p.m.
Tue, Feb 14, 2012 : 4 p.m. This article is good food for thought but, it's kind of like asking the prisoner would they prefer to be shot or hung, all the name calling is unnecessary, it is part of the problem with people today, we need calmer minds to work hard to find solutions to these problems. I too, would like to see follow up articles on this subject in the future, the author is to be commended for bringing it forward. Tue, Feb 14, 2012 : 3:32 p.m. I can't find anything in this article to support the idea that a state-appointed emergency manager is necessarily, or even likely, to be &quot;kinder, gentler&quot; than a bankruptcy judge. Nothing. &quot;Bankruptcy judges are generally not swayed by emotional pleas and political rhetoric. After all, they're appointed — not elected. They don't answer to the ballot box, so it's much easier for them to sign off on unpopular decisions. A bankruptcy judge, seeking simply to balance a city's budget, will readily condone recommendations to sell off treasured community assets, Pottow said.&quot; What reason is there to think an emergency manager would be any different? Tue, Feb 14, 2012 : 6:42 p.m.
How about this: <a href="http://www.bloomberg.com/news/2010-12-14/vallejo-s-california-bankruptcy-failure-scares-cities-into-cost-cutting.html" rel='nofollow'>http://www.bloomberg.com/news/2010-12-14/vallejo-s-california-bankruptcy-failure-scares-cities-into-cost-cutting.html</a> Take note of what the legal fees alone are. Big difference to me. A city will not accumulate these fees unless they wish to sue the EFM. Tue, Feb 14, 2012 : 5:27 p.m.
EFMs are political appointees too, with &quot;wheels to grease and backs to scratch.&quot; Also, communities don't appoint their own EFMs, they are assigned by the Dept of Treasury and appointed by the Governor. Why would an EFM necessarily have such a vested interest? Tue, Feb 14, 2012 : 4:48 p.m.
Pottow is incorrect in the sense that judges are human and therefore entirely corruptible either by conscious choice or special interest or through more passive, but equally powerful, means like their own beliefs and values. Judges are appointed by politicians of a particular party persuasion who have wheels to grease and backs to scratch. Make no mistake judges are not impartial in any sense and may be loose cannon in their motivation. EFM's on the other hand DO have a very specific and vested interest in the success of the commuity. The community wants it's appointee to care about it's own viability. Thanks for publishing this; more information is always good. I like Alan Jackson's point about EFM and bankruptcy having different winners and losers. Do you think AA.com could make a table comparing who the different winners and losers would be? One thing that worries me is that financial institutions (creditors) are very vocal and influential, but their interests are not necessarily aligned with the interests of the people. If the banks took on too much risk (bought Detroit city bonds), then shouldn't they just accept the loss? Why do they have to be saved from the downside of their gamble? For the most part banks don't buy city bonds. Most are owned by retirees. Neither solution will work. The silly comments that &quot;they spend too much&quot; are just wrong. Detroit has about 40% of the population that it once did. Flint has just over half of what it once did. The manufacturing is gone. They still have fixed costs without the tax base. I drove through the Detroit neighborhood that I grew up in and 2 of 3 houses were simply gone. Does the city just stop plowing 2/3 of the roads or pick up trash every third week because there are less houses? Maybe remove 2/3 of the traffic signals to reduce those costs. Schools close and kids don't have transportation to travel several miles to the nearest school. Cutting police and fire services to half of what they once were to serve half as many residents doesn't mean that you cut your costs in half if you still serve the same area. There is no simple solution short of consolidating neighborhoods if businesses and people don't want to move back. Tue, Feb 14, 2012 : 9:32 p.m.
Soothslayer, as is pointed out in the most recent census data, Detroit lost fully 25% of it's majority black population between 2000 and 2010. This has had a much bigger impact on the city's current dilemma than population losses of more than 40 years ago. You are correct, but that doesn't change the current situation. Funny you should say that though. It was 1967 when my parents moved from the city to a Pulte built house in the middle of a cornfield, just about an hour from my dad's office in the Fisher Building. Tue, Feb 14, 2012 : 4:37 p.m.
White flight gutted Detroit and nearby communities starting 40 years ago. Gas was cheap, exec pay was high and overtime on labor jobs were plenty. People thought nothing of commuting an hour each way to work in their 13 MPG SUVs from their former farmland &quot;white only&quot; Pulte home neighborhood. Now we're ALL going pay the price tenfold for this inane behavior. Tue, Feb 14, 2012 : 2:11 p.m. When a city files for bankruptcy, it is THEIR option, and the city is willing to bite whatever bullet it has to take. With an emergency financial manager, it is NOT their call. The EMF is not only a hostile takeover, it is a DICTATORSHIP. Tue, Feb 14, 2012 : 4:23 p.m.
You can't simply erase debt via bankruptcy, it just gets spread around. EFM is a much more responsible, compassionate and fair option for everyone both in AND outside of the affected community. Bankruptcy is an old school &quot;put it off till later&quot; approach and doesn't actually promise to solve any of the issues at hand. Tue, Feb 14, 2012 : 4:19 p.m.
That is just not true. No one chooses bankruptcy, it forced on them by circumstance. Once in bankruptcy the people have no choice, it's all up to the judge. It's just a different DICTATOR, but still a dictatorship. Tue, Feb 14, 2012 : 2:09 p.m. I wonder why the &quot;TEA PARTY&quot; was formed? Maybe, to stop our elected officials from spending more than they take in? Ann Arbor is suppose to be one of the smarter cities in the US but after reading the comments I wonder?? Tue, Feb 14, 2012 : 1:50 p.m. The difference between an emergency financial manager and bankruptcy is there are different winners and losers. There are also different long term consequences. To a large extent EFM is better for creditors and business wheras bankrupcy is better for citizen control and municipal employees. When municipalities default the losers, bank and other lendors punish the municipality with higher rates on loans. Since Detroit and other effectively banrupt cites can already expect high rates on loans why improve the balance sheet and reduce some liabilities? An EFM is like a hotile takeover. Who would pick that option? Tue, Feb 14, 2012 : 6:27 p.m. Here is the difference Al, take a look at this: <a href="http://www.bloomberg.com/news/2010-12-14/vallejo-s-california-bankruptcy-failure-scares-cities-into-cost-cutting.html" rel='nofollow'>http://www.bloomberg.com/news/2010-12-14/vallejo-s-california-bankruptcy-failure-scares-cities-into-cost-cutting.html</a> I wonder if a city has to hire a lawyer and pay $9.5 million in legal fees when an EFM is assigned by the state? Tue, Feb 14, 2012 : 2:06 p.m.
Bankruptcy is also infinately better for the lawyers on both sides. You're not a lawyer are you? Tue, Feb 14, 2012 : 1:38 p.m. I don't see a significant difference between bankruptcy and EFM. The 'democracy' and will of the people seem to go out the window with both (Judge is unelected &amp; restrict the politician's ability to (pay for, &amp; by fiat) lead and EFM can fire elected people). Unions are either losing their current contract or having similar financial losses on their next contract. Most other differences are speculative and future predictions/guesses. It just seems like a lot of political posturing and hand wringing over very minor differences of austerity. Tue, Feb 14, 2012 : 1:33 p.m. They voted for the officials. They knew the risks. I say let them go bankrupt. Tue, Feb 14, 2012 : 4:14 p.m. I agree about the accountability part but this is a lesson those voters will never learn (e.g. its too late). Detroit, Pontiac, Ypsi, etc going bankrupt would be like A-bombs going off in each of those areas. The negative effects would be long lasting and much more widespread than the immediate community. The government acted like an EFM for the automakers, think of the damage and waste caused if they simply failed and didn't get a leg up. Tue, Feb 14, 2012 : 1:24 p.m.
Tue, Feb 14, 2012 : 5:09 p.m.
Tue, Feb 14, 2012 : 2:58 p.m.
Wow, what a totally incoherent post from Mr. Ingersoll. Where to begin? It would be just as easy to blame VOTERS for electing Republicans whose only idea is to cut taxes, cut taxes, cut taxes. The bleak economic situation faced by the cities &mdash; not to mention this state, ALL states, and the federal government itself &mdash; is more the result of a lack of revenue than overspending. And how did that happen? Tax cuts, tax cuts, tax cuts. Don't forget that it was a Republican, Grover Norquist, who said &quot;I'm not in favor of abolishing the government. I just want to shrink it down to the size where we can drown it in the bathtub.&quot; That is their entire goal &mdash; defund the government to the point that it's unable to meet basic services, which in turn will cause voters to lose faith in government, which becomes a vicious circle in which Republicans get to bring about all of their most insane &quot;small-government&quot; fantasies. That party is no longer interested in governing, in providing services to the citizens &mdash; instead they want to &quot;drown [government] in the bathtub&quot; while blaming it for all of society's problems. It's time to stop believing the Republican lies about tax cuts and &quot;small government&quot; and start rebuilding a responsible government &mdash; federal, state, and local &mdash; that has enough funding to provide essential services at more than a bare-bones level. The country worked better when we did that, and unconstitutional measures such as the emergency manager law were the furthest thing from anyone's mind, because they were completely unnecessary. Yes, there is corruption and waste in government. But the solution to those problems is to root out corruption and waste, not eliminate government funding. Tax cuts never solved a problem &mdash; they only made minor problems into major ones, and led to such travesties as Rick Snyder's emergency manager law. Tue, Feb 14, 2012 : 1:32 p.m. The &quot;corruption,&quot; &quot;lawlessness,&quot; &quot;incompetence,&quot; and &quot;laziness&quot; of &quot;VOTERS?!? !&quot; Are you seriously arguing against the concept of local democracy? Do you seriously believe decisions are better made by unelected, unaccountable bureaucrats -- rather than by locally-elected representatives?! Also, regarding &quot;race-baiting victims&quot; ... exactly where in my comments did I mention race? There are many Michigan cities of all different sizes and demographics facing these financial challenges. Again, this is not about &quot;incompetent voters,&quot; or about &quot;race-baiting,&quot; this is about a Michigan's broken system of funding public schools and local governments. Tue, Feb 14, 2012 : 1:15 p.m.
Tue, Feb 14, 2012 : 6:10 p.m.
Tue, Feb 14, 2012 : 6:06 p.m. Here is a great example. Note the legal fees related to the bankruptcy: <a href="http://www.bloomberg.com/news/2010-12-14/vallejo-s-california-bankruptcy-failure-scares-cities-into-cost-cutting.html" rel='nofollow'>http://www.bloomberg.com/news/2010-12-14/vallejo-s-california-bankruptcy-failure-scares-cities-into-cost-cutting.html</a> Here is another where pensioners were unpaid, maybe still are: <a href="http://www.nytimes.com/2010/12/23/business/23prichard.html?_r=1&src=twrhp" rel='nofollow'>http://www.nytimes.com/2010/12/23/business/23prichard.html?_r=1&amp;src=twrhp</a> Here is an interesting story that includes cities you would not expect to be having trouble: <a href="http://www.businessinsider.com/americas-most-bankrupt-cities-2010-12#cincinnati-ohio-4" rel='nofollow'>http://www.businessinsider.com/americas-most-bankrupt-cities-2010-12#cincinnati-ohio-4</a> There are lots of stories out there, just search online for bankrupt cities. Tue, Feb 14, 2012 : 1:14 p.m. I want to add examples of businesses that earn money throughout the country: Coca Cola,Caterpillar, Monsanto, and Apple. International companies also include Ambev, which bought American beverage companies. Tue, Feb 14, 2012 : 1:12 p.m.
Mr. Bomey has a future as Rick Snyder's spokesman. Tue, Feb 14, 2012 : 9:51 p.m.
Tue, Feb 14, 2012 : 4:10 p.m.
Tue, Feb 14, 2012 : 1:10 p.m. It is interesting that the article doesn't even mention the financial stress that Ypsilanti is facing, and how having an EFM or bankruptcy would impact that local community. Our current skeleton crew of city employees are holding things together, working the jobs that several people used to do, getting more creative and putting in more of themselves than ever. If some outside judge or manager came in, slashed their pay/benefits, what would be their incentive to keep trying to hold things together? If the judge or manager came in and sold off our city assets at auction, how would we ever get them back? If our quality of life in the city changed dramatically, who could we complain to? The difference with Ypsilanti is that we are ready to fight to keep the city intact and ride out the wave of instability that many other communities will drown under. Other cities, populated by short-sighted folks who are less well educated about the issues may watch their communities fundamentally change and slip away, but Ypsi has a chance. Our people aren't caught up in the Tea Party ignorance, they are willing to do what needs to be done. Vote YES on BOTH ballot proposals on May 8 to SAVE YPSILANTI. Tue, Feb 14, 2012 : 9:21 p.m. Excellent post, City. Ypsi, much like Westland, has been been very proactive in anticipating and trying to mitigate its funding imbalances, which I think is the only reason it's not much worse off than it is. Tue, Feb 14, 2012 : 4:09 p.m. The main issue is control and fifedoms don't want to give it up. The &quot;incentive&quot; in slashing pay/benefits, if it's deemed neccessary, is that the valuable workers get to keep their jobs whereby they can then continue holding the community together. Only assets that have a chance of making an worthwhile impact (e.g. prime real estate) would be considered for sale for approved use otherwise what's the point (no value = no benefit to selling). No changes are going to be made that devalues assets or makes present matters worse for the community. The EFM does have a vested interest in the community and wants it to become sustainable and viable so it can contributes positively to the whole (in this case Michigan) as quickly as possible. You can't spend your way out of debt, you want the services of the EFM. Bankrupcy, along with burying your head in the sand, solves absolutely nothing. Tue, Feb 14, 2012 : 12:55 p.m. The same reason the same people are filing for bankruptcy every 7 years. Bankruptcy doesn't fix the problem. The problem is over spending. The proper solution if the elected officials can't do their job is to appoint a manager. I realize that proper logic doesn't make sense to a lot of people in the amoral world we live in but you can't keep doing the same things and expect a different result. Tue, Feb 14, 2012 : 5:58 p.m. Along with Soothsayer, I wonder the same thing, what is your idea of a solution? Raise taxes to bail out these cities? Sorry but I do not agree with that, I do not want to pay more taxes to rescue cities who made bad decisions. By bad decisions I mean that the first year a deficit appears a municipality has to act. Make cuts, whatever it takes. Taking no action means deficits will build up and the worse they become the more likely residents and business will flee. Tue, Feb 14, 2012 : 4:34 p.m. Sorry City, the problem is, at its core, simple. Municipalities funding tax on property values, gas tax, sales tax, parking fees, lottery, user fees like phone, amongst other sources. Revenue is actually quite diverse in its sources. In contrast to your assertion that &quot;we cannot cut&quot;, many communities have cut already and they are stronger today for it. It is simply necessary to NOT live beyond your means. Rearranging the deck chairs on the titanic will not keep it afloat. Tue, Feb 14, 2012 : 3:54 p.m.
@ City - &quot;Isn't that simple&quot;? Yes it actually is. Lest we scrap the entire foundation where our economic system depends on some value behind the printed dollar difficult but necessary austerity and, more importantly accountability, measures need to be put in place at each and every level. Exactly now do you plan to make up for municipal deficits? Via decades of trickle up policy the money is now gone from the system and more printed money (debt) from on high isn't the answer. As will soon be demonstrated Greece ain't got nothing on us. China's about to cut up our credit card. The problem isn't that simple, Tom. The way we fund municipalities is flawed - depending almost entirely on property values, capped and stymied by Headlee and Prop A. When the foreclosure crisis gutted property values, it also gutted municipal budgets - but did nothing to decrease costs. We simply cannot cut our way out of this if we hope to have any of the services that keep our communities safe, clean and comfortable. Tue, Feb 14, 2012 : 12:08 p.m.
Am I the only one bothered that this paternalistic &quot;solution&quot; is used disproportionately in majority African-American cities? Tue, Feb 14, 2012 : 9:17 p.m.
Sh1, is there some sinister force compelling the &quot;majority African-American&quot; cities you speak of to fit the criteria for an EM at a disproportionate rate? Your question has the cart before the horse. The EM law does not create the conditions that warrant it's use. Are there other cities in MI that aren't &quot;majority African-American&quot; that are in similar straits and not under the threat of an EM? Wouldn't we all be better served by occupying ourselves with ensuring the fair and even application of the law as it exists, and not manufacturing non-issues and promoting baseless racial division? Tue, Feb 14, 2012 : 6:55 p.m.
&quot;You should be bothered that we have allowed majority African-American cities to develop, without the benefit of adequate jobs, schools, streets, or public safety. We all share the blame in creating that problem.&quot; ....so. Help me out here. Why do I share blame for Detroit's failure when I've never lived there? Tue, Feb 14, 2012 : 3:10 p.m. So what are we to believe? That there is some secret concerted effort on the part of government to slam African Americans? That the EM's were invented solely for the purpose of harming those communities in particular? Get real. Tue, Feb 14, 2012 : 2:28 p.m.
Tue, Feb 14, 2012 : 2:03 p.m.
Tue, Feb 14, 2012 : 12:53 p.m.
You should be bothered that we have allowed majority African-American cities to develop, without the benefit of adequate jobs, schools, streets, or public safety. We all share the blame in creating that problem. Tue, Feb 14, 2012 : 11:54 a.m.
What, exactly, is the point of this column? Mr. Bomey spends an entire page arguing how one terrible option (the appointment of an unelected, unaccountable &quot;Emergency Manager&quot;) is, in his opinion, slightly better than another terrible option (municipal bankruptcy). Yet, he fails to mention the underlying conditions that have caused so many Michigan cities to have these problems in the first place: Michigan's system for funding public schools and local governments is entirely broken, and neither the Governor, nor our State Legislature has offered any plan to fix it. Instead of just repeating Snyder administration talking points, perhaps Mr. Bomey should do some actual research, and report to readers why it is that so many Michigan cities and school districts are facing these ongoing, structural budget shortfalls -- and about what could be done to fix these problems, in a more long-term and sustainable way. Tue, Feb 14, 2012 : 10:06 p.m.
Tue, Feb 14, 2012 : 9:24 p.m. It's amazing how much traction this &quot;broken school funding&quot; fiction is able to maintain. Michigan schools get more money per pupil than most other places in the country. The problem is waste, fraud and mismanagement, in no particular order. Those factors are also why many lower-funded schools in MI have better academic success than some that are better funded. Yeah sure. I recall that school funding was considered &quot;broken&quot; in 1994 and put to voters who overwhelmingly approved Proposition A for funding schools. By the way, the point of the column is to explain why the emergency financial manager law is better for cities than bankruptcy. It does not address why and it is not up to you to decide what he should be writing about. Tue, Feb 14, 2012 : 4:41 p.m. The reasons 'why' structural budget deficits exist vary slightly from incompetent management to fast economic downturn. Either way the long term solution you seek is what is being discussed. Cut spending or raise taxes or some combo of the 2. The other issue is WHO gets to make those calls a bankruptcy judge or an EFM. The problem is with emergency managers AND their failure to see the real issues. Businesses that benefit from consumers throughout the country (think banks) don't spread philanthropy throughout the country. Banks such as Chase donate to community causes in New York City. Chase does business in Michigan, but hasn't stepped forward to help Detroit maintain community centers. Months ago I heard a NYC based television &quot;personality&quot; defended holding taxes low for NYC businesses on the basis of their philanthropy throughout the city. Actually, paying taxes is what spreads earnings of national companies throughout the country. What's going on now is with emergency managers or with the threat of emergency managers, those who provide vital city services sacrifice and the Chases and Targets stay above the fray. Tue, Feb 14, 2012 : 5:48 p.m. This is the first time I have read/heard anyone blaming banks for debt problems in cities. I do not think what banks in NYC do is pertinent in Michigan. I would prefer drawing business that hires residents (who pay state and local taxes) than raise taxes on business who then will locate in areas with lower tax rates. Which is what is happening now and that is where the jobs are. Tue, Feb 14, 2012 : 5:17 p.m.
Once again, blame someone for &quot;not paying their fair share&quot; rather than the real problem which is mismanagement by our elected &quot;leaders&quot;. This dodge and blame game always comes up locally, and now nationally to hide the fact that our government acts out of political thinking rather than sound economics and being fiscally responsible. Trust me, the companies that are remaining in Detroit deserve huge credit for not abadoning a city that is corrupt and has a huge failure of its leaders, you can't blame them for whats going on in these failed cities.